From over-the-cup brewers to French press cups-to-go, here are a few of our favorite coffee gadgets that will help you get your caffeine fix. Love your French press but don’t love the fact you can’t take it with you when you’re on-the-go? Peet’s has the solution! Made for Peet’s by Bodum, this 16-ounce travel mug lets you make and take your coffee in minutes. 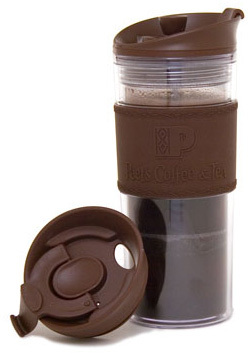 The mug has a brown grip that features the Peet’s logo and gives you the ultimate carrying comfort. Simply measure out your ground coffee, pour it into the mug, secure the lid and press down. It also comes with an extra lid and is BPA-free. If a single cup of coffee is beckoning for you — and you don’t want to mess with the 12-cup coffee maker — this over-the-cup coffee brewer will give you coffee in minutes and for pennies! The pour-over method of coffee making is the growing trend in coffee right now, and the Ready Set Joe mug set, which includes the cone and a ceramic mug, gives you the ability to sip a perfect cup of java wherever you have access to hot water. Just place the cone over the cup, line it with a filter, fill it with your favorite ground coffee and pour hot water over the grinds. You can sip as soon as your cup is full. 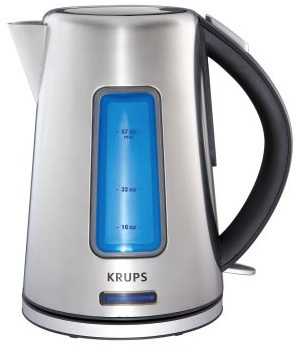 Whether you need water for your French press or over-the-cup brewing system, the Krups electric kettle will quickly heat your water up. You can also use it for those times when you’d rather sip a cup of tea or hot cocoa. The brushed stainless steel kettle has a 6-cup capacity, safety auto shut-off, and a removable washable filter. 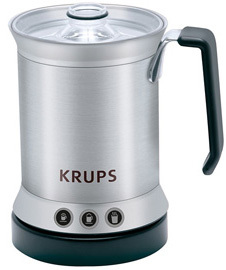 If cappuccino and lattes are a daily part of your life, the KRUPS milk frother will make every cup a barista-style experience. It comes with a nonstick aluminum jug with measurement lines, removable frothing device for easy cleaning, insulated stainless steel handle and three settings for frothing. On those insomniac nights, you can press the Hot Milk button for a soothing sip to lull you into sleep. For the coffee connoisseur who grinds her own coffee, this burr coffee grinder offers two precision, flat cutting burrs will grind perfectly for coffee or espresso. Even better, the KitchenAid coffee mill is quiet so you won’t wake the household and can enjoy your first cup of coffee as the sun rises. This model also has a gear reduction system that reduces the static cling that occurs with coffee grinders that have plastic components. 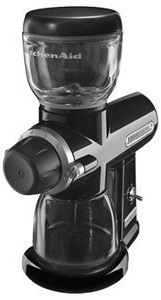 This coffee grinder may seem pricey, but it is less expensive than many high-end burr grinders and it is built for years of coffee grinding. Once you taste coffee from Melitta, you’ll want to drink it forever. 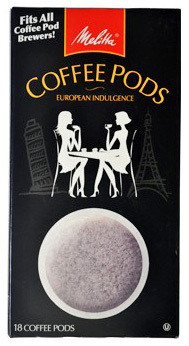 True to its European heritage, Melitta sources only premium coffees grown in the finest coffee-producing regions of the world to give you a richly-flavored, never bitter, coffee drinking experience. Available in single serve coffee pods designed to fit all Senseo Pod Coffeemaker (Senseo no longer sells pods in the U.S.) and Hamilton Beach Pod Coffeemakers, Melitta offers a variety of flavors to suit whatever coffee mood you’re in.